【アジャストメント 第01段落】　David Norris runs for the United States Senate. In 2006 he loses his lead and, while rehearsing his concession speech in a hotel bathroom, meets a woman hiding in a stall. She encourages him to be more honest. Attracted to each other, they kiss before David leaves to make the speech. Inspired, David goes off script and makes an honest speech that makes him a favorite for the 2010 Senate race. 【アジャストメント 第02段落】　Later, a man sits on a park bench and is instructed by an apparent coworker to ensure that David spills his coffee on his shirt by 7:05 AM. The man falls asleep, failing in this task. 【アジャストメント 第03段落】　Riding a bus, David encounters Elise, the woman from the bathroom, who gives him her phone number. David works at a firm run by his campaign manager, and arrives early. He finds his boss motionless and being examined by unfamiliar men in suits. 【アジャストメント 第04段落】　They chase him, and no matter where he runs they catch up to him. David is taken to a warehouse, and Richardson tells him about the Adjustment Bureau. They have a plan for David and are determined to guide his life. The plan was created by "the Chairman". If David tells anyone about them he will be "reset", effectively lobotomized. 【アジャストメント 第05段落】　The plan called for him to meet Elise only once, and he is told to forget her; Richardson destroys the paper with her phone number. Harry Mitchell, who failed to intercept David, tells him about his role as a "caseworker", who is sometimes referred to as an angel. 【アジャストメント 第06段落】　Three years later, David has taken the same bus every day hoping to see Elise. He encounters her one day and they reconnect. 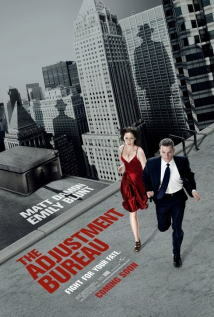 The Bureau tries to stop him from building his relationship with her, causing their schedules to separate them. David races across town, fighting the Bureau's abilities to "control his choices" to ensure he will meet Elise again. During the chase, The Bureau uses doors to travel far across New York City. 【アジャストメント 第07段落】　Richardson discovers that David and Elise were meant to be together in an earlier version of the plan, and Harry speculates on whether or not the plan is always correct. 【アジャストメント 第08段落】　David and Elise spend an evening at a party, connecting when David tells her he became a politician after the loss of his mother and brother. They spend the night together, expressing their bond the next morning. 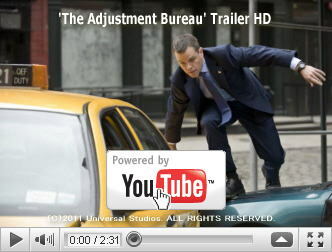 【アジャストメント 第09段落】　The Bureau has Thompson take authority regarding David's adjustment. He takes David to a warehouse, where David argues he has the right to choose his own path. Thompson releases him, and he runs to Elise's performance with the Cedar Lake Contemporary Ballet. 【アジャストメント 第10段落】　Thompson follows, revealing that not only will David's future as President of the United States be ruined if he stays with Elise, but her future as a dancer will be diminished. To make a point, he uses his adjustment power to cause Elise to fall and sprain her ankle. Overwhelmed with his future in jeopardy and faced with hurting Elise, David abandons her at the hospital. 【アジャストメント 第11段落】　Eleven months later, David runs for election again and sees an announcement of Elise's imminent wedding. Harry, feeling guilty for earlier events, contacts David. Harry reveals that Thompson exaggerated the consequences of David and Elise's possible relationship, and teaches David to use the doors so he may stop Elise's wedding. He gives David his hat, empowering David to use the doors. 【アジャストメント 第12段落ネタバレ】　David finds Elise in the bathroom of the courthouse where she is to be wed. Initially furious and hurt after his earlier desertion, Elise is shocked when David reveals the Bureau's existence to her. 【アジャストメント 第13段落ネタバレ】　They are chased across New York. When David and Elise find themselves on Liberty Island, David decides to find the Chairman. Elise almost backs out of the scheme, but finds the conviction to follow David. 【アジャストメント 第14段落ネタバレ】　David turns the door handle to the left, which Harry warned him only his kind were supposed to do, and enters Bureau headquarters. The couple is chased through the Bureau until they are trapped on a rooftop above New York. 【アジャストメント 第15段落ネタバレ】　They admit their love to each other, assuming the worst is about to happen. When they release each other, the Bureau members have disappeared. Thompson appears, but is relieved of duty by Harry, who tells David and Elise that the Chairman has changed the plan so that the couple can be together.